The drive wasn’t too bad–just a little traffic. However, people of Boston are you living in an alternate universe? Good aftahnoon from Bah-ston. Helaine and I have checked in to our hotel and will be leaving soon for Fenway Park. The drive wasn’t too bad–just a little traffic. However, people of Boston are you living in an alternate universe? I used to drive here as a college student a zillion years ago, but I don’t remember such total denial that there might be other people on the road! A city bus made a left turn as I was entering an intersection with the right-of-way. The driver held her hand up like she was a traffic cop. What was I going to do plow into her to make a point? She wasn’t the only vehicle to beat us to the punch at an intersection. The grand prize, however, goes to pedestrians. The have been darting from between cars like cockroaches, often only a few feet away from legitimate crosswalks! Most crossed without bothering to look at their potential fate. Unreal! 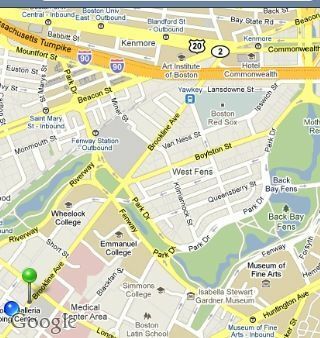 We are at a hotel in the vicinity of Dana-Farber and other hospitals. Pulling into the garage nearly everyone we saw was wearing Phillies gear. “Go Phillies,” Helaine yelled at a family walking out of the lobby. We are among friends. Hopefully they will be happy friends later this evening (and tomorrow). Game time 4:05 PM.